New research is demonstrating that with early identification and intervention, youth who experience psychotic disorders, like schizophrenia, can go on to experience long and fulfilling lives. 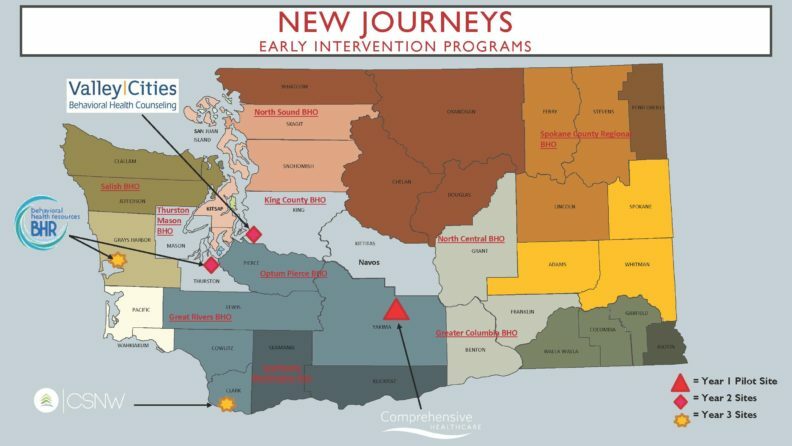 In 2015, the Washington State’s Division of Behavioral Health and Recovery (DBHR) provided additional funding to compliment the funding set aside by the Mental Health Block Grant to develop and implement a first episode psychosis program for Washington State New Journeys, a coordinated specialty care intervention based on the NAVIGATE model. The goal of this program is to help youth between the ages of 15 to 25 years old and their families, who are experiencing their first episode of psychosis, develop the skills needed to recover and thrive as soon as possible. As of 2018, our team at WSU is at the forefront of the New Journeys evaluation. In partnership with Washington State Department of Behavioral Health and Recovery, the University of Washington, and community mental health centers throughout the state, we have implemented and evaluated five New Journeys Early Intervention Programs.